We were in Nubra valley and happened to stop by Sumur monastery early Sunday morning. We were very fortunate to be part of the prayer session and were invited in by the monks. 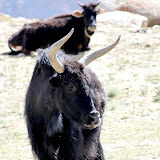 Other places we visited were Diskit, Hundar (both Nubra valley), Leh, Shey, Likhir, Nimo, and Pather Sahib. If you are planning a road trip through Ladakh, a word of caution before you consume this rosy sounding travelog. Keep checking on your Leh-Manali route, even after you’ve packed and set to go, and not online. Websites and blogs rarely tell you about actual weather conditions in this region. Do call the J&K tourism centres. Lahaul-Spiti weather is extremely unpredictable and it changes drastically by the day. If it’s a clear sunny day today, then it could snow enough overnight to block a pass for days. This was my particular experience. Baralacha La is one such pass. Khardung La is another. Also do consider and check thoroughly the Jammu – Srinagar – Dras – Kargil route. For Khardung La, even a resident of Leh cannot tell what the weather will be like up in Khardung, even if its a nice sunny day in Leh. So pad up. Your vehicle must be a SUV. Carry full size rubber boots. Driving on snow needs experience. Cell connectivity is a security issue in the J&K area so your phones are useless. Avoid driving at night. It snowed on our way down from Lachulung La and we reached Leh at night. The rocks are loose all the way so landslides are common. Well… fly if can! Last year the passes were open in May. So leaving for Ladakh in the first week of June seemed ok to us. Not so. The weather has taken a turn this year. Our car and others were stuck in Baralacha La. You must leave Keylong by 5 a.m. and clear this pass before 8 am; else the snow formed on the sides starts melting in the morning and makes a slush with the mud on the road. God help if that section of the road is deep enough to submerge half your tyre. Four vehicles were stuck there for an hour. One tip here- do not speed on snow. There is a way to let the vehicle roll at a low speed and maneuver with the steering. But this is not enough to know. The size and weight of your vehicle matters. You’d better have the nerves for this. I was just about getting the hang of driving on snow till my car was stuck for the third time next to Suraj tal. Can a small car reach Khardung La? Yes it can; but a good time of the year and a seasoned driver can make it happen. We didn’t have either! My car had to be towed out of this area later. After we cleared this area, Baralach La was closed the next day – June 8 onwards, for 10 days. On my return I learnt that there had been some serious casualties in that area. Anyhow, we reached our elusive destination, all thanks to the gentlemen who gave us a lift from Sarchu till Leh. The true essence of Ladakh is in its monasteries, long walks alongside local people, the spiritual topography and general quiet. So it hurts to see Leh selling off to the tourist flea market (like Goa has), and c’mon, it doesn’t need to. It has to keep intact its sanctity and it should. For one, cars must be banned in a half km radius around monasteries, so only those who have some regard for the 400-year-old heritage will enter and walk the area. The streets in Leh city look no different from Pahaad Ganj in Delhi- and its non-CNG, polluting, unpoliced traffic. The main Leh market and palace could use a half km car-free radius. Do spend enough time in temples in Likhir, Shey palace, Diskit and Sumur monastery in Nubra valley. Leh palace is like a time capsule- bolting you into an era of kings, hyperactive ministers and family scampering through the low doors and dark corridors. There is a temple in one of its chambers.